For someone who regularly finds her wallet in the freezer, bakes challah at 3 am, sleep crafts, and occasionally eats a sandwich in the shower, you know, just for fun, Barbara Whitney is a model of sanity. 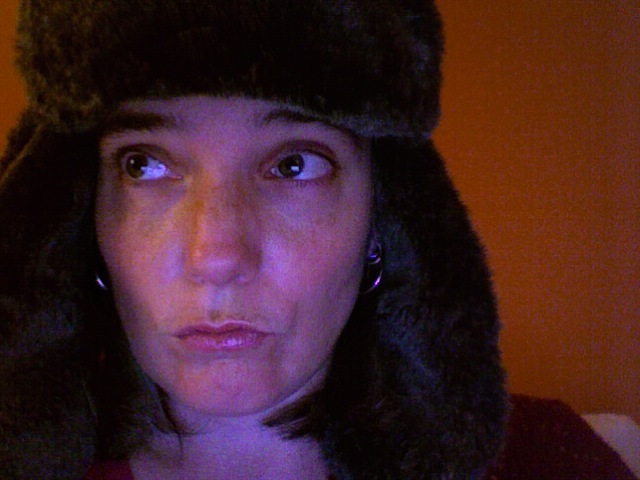 A model of sanity who is really struggling with writing this bio. She’s ‘turged, directed, devised, performed, puppeteered, production managed, and taught at a variety of places around the world – from Carnegie Hall to Chicago’s South Side St. Patrick’s Day Parade to under a tree in Bangkok. She spent years touring internationally and causing a theatrical ruckus domestically and is proud to have made a living as a freelance artist for 13 years. For the past 4 years she’s been a high school theater teacher where she encourages students to think of themselves as vast beings who exercise curiosity in the out-of-the-ordinary. And who embrace looking like an idiot, and say please and thank you. She is much less of a hippy than this bio makes her sound and, for the skeptics, has a legitimate theatrical resume with credentials and stuff that she’s happy to share if they’re happy to turn their clothes inside out to confuse the fairies. Mainstream is often interesting and worthwhile but the edges are where things happen. Over here at PwritesCom, we’re thinking a lot these days about the various modes of creation for new work — especially in advance of the Freedom Art Retreat. On one side of the spectrum of creation techniques there’s the single generative artist (playwright, or auteur director) who assembles to themselves a set of collaborators and sub-creators to bring the work to fruition. On the other end, we have totally ensemble devised works in which all participants, from actor to designer, have equal standing in the direction the work takes. I recently stumbled upon a useful set of charts which help to visualize the differences. First, I’ve long been a fan of the way Austin’s Rude Mechs conceives of its ensemble creation process. It’s one where members wear the very definite hats of Playwright, Director, Actor, Dramaturg, Designer, etc, but only at certain points. There’s a malleability in the structure of creation which I find inspiring. 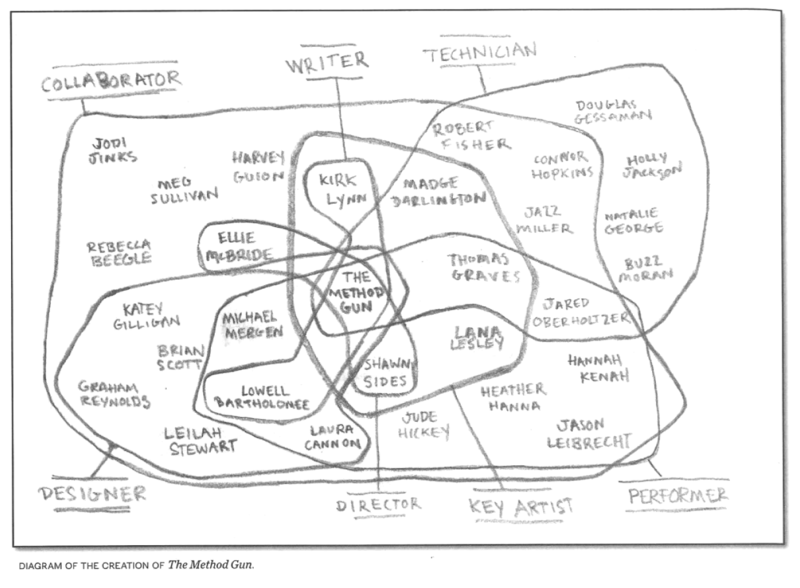 This is the diagram they used to explain the jobs of ensemble members in the creation of The Method Gun. This image originally appeated in issue number 4 of Play: A Journal of Plays, published by Paper Theatre.